This gown would have been worn as a 'tea gown', as an informal 'at home' dress for the late afternoon, or even as a simple dinner dress. It was made for a member of the Liberty family, who owned a store in Regent Street, London. The green and yellow damask was registered as 'Hop and Ribbon' by Liberty's in 1892-1893. In 1884 Liberty's had opened a dress department under the guidance of the designer E. W. Godwin. He was a member of the Aesthetic Movement, which favoured 'artistic' dress for women based on classical, medieval, Pre-Raphaelite and Renaissance clothing. The gown is close to Walter Crane's designs for Aesthetic dress in Aglaeia, the journal of the Healthy and Artistic Dress Union. The 'greenery-yallery' colours are a feature of Aesthetic taste, while the epaulettes and high-waisted, dark green velvet overdress are historical references. 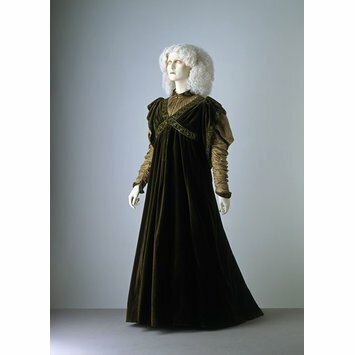 The dress is inspired by the fashions of the late 15th century and consists of a dark green velvet overdress, with epaulettes, a wide V neckline, a high waist and a full, gathered skirt. It is trimmed with bands of satin-stitch embroidery in paler green silk and iridescent beads. The neckline is filled with a pleated front of green and yellow Liberty Hop and Ribbon damask. The same material is used for the gathered leg-of-mutton sleeves. The gown is lined with green silk and has a yellowish green frill at the hem. The bodice fastens in the front with hooks and eyes and is boned. The back of the skirt is held with tapes and elastic bands. The gown was made for a member of the Liberty family. Purchased from Susan Cowdy (nee Stewart Liberty, 1914-1996), who stated that the hat and dresses were worn 'by a member of the Liberty family'. Susan Cowdy's mother was Evelyn Katherine Phipps (1889-1966), so these pieces from the 1890s are possibly worn by her mother, Ada Rebecca Liberty (1853-1933). Susan Cowdy's address was 'Swyllmers', The Lee, Great Missenden, Buckinghamshire. Dress of silk velvet and embroidered silk damask, retailed by Liberty & Co., London, ca. 1894.